2. External dimensions are the same for all H101 models. 3. The fuse is housed in a ceramic cylinder case. 1. When the current exceeds the rated value, the thermal fuse will activate at a lower temperature than the fusing preset temperature. Check to be sure that the current does not exceed the switching capacity. 2. Unexpected force or shock during transportation or mounting may cause breakage of the thermal fuse. Furthermore, if the ambient temperature goes up, it may lead to an accidental fusing at a lower temperature. So, be careful regarding the ambient temperature. 3. Keep the temperature sensor (protection tube) horizontal or pointing downward (lead wire will be at the top) when in use. If it is used with the temperature sensor up, it may cause a malfunction. 4. Do not use in an environment where vibration or shock is constantly applied. 5. Watch for other heat sources, and try to avoid thermal interference. Be careful of fuse malfunction due to unexpected other heat sources. 1. For storage, avoid high temperature places. 2. Ceramic protection cylinders tends to crack. So, be careful when handling. 3. Do not use the fuse without the protection tube. 4. Keep the load current within the rated value. 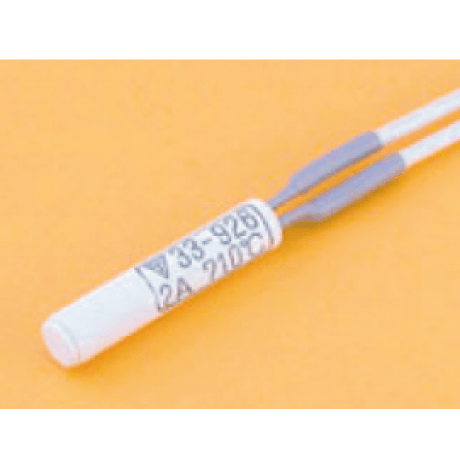 In principle, the temperature fuse is meant to be used as a fail safe measure. The correct system design is such that a thermostat is used for temperature control and a temperature fuse activates if the thermostat becomes defective.